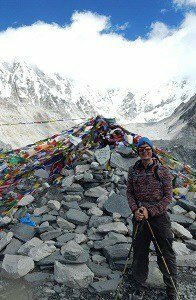 Tom Langan works full time for Lost Earth Adventures, guiding in the UK and in Nepal. You’re just as likely to see him down the depths of the UK’s deepest caves as you are high on a mountain top. He’s recently been sussing out the Everest region’s best teahouses. You can read about his latest adventure below. 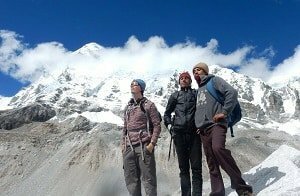 This is an account of the Everest Base Camp and Three Peaks Trek during my recent visit to the area as I checked out guest houses and current conditions for our upcoming 2017 trips.You can find out more about our Everest Base Camp Treks here. I recently had the opportunity to research the guesthouses along the Three Pass Trail in the Everest region of Nepal. 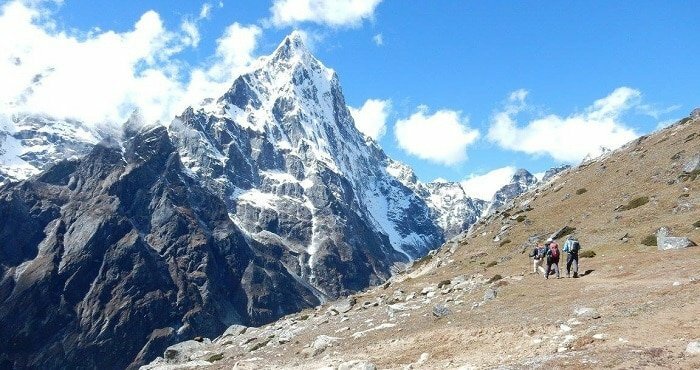 This is a 20-day trek, climbing three passes over 5300m. 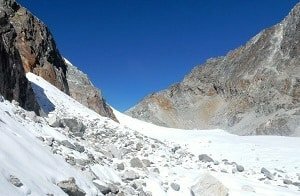 Along the way reach Everest Base Camp, cross glaciers and witness the sun rise above Everest from the nearby summit of Kala Patthar. Even getting to the trail is an adventure, involving a flight in a light aircraft to reach the start of the trail. Flying from Kathmandu to Lukla, the start of the trail to Everest, is unlike any other flight I have taken. Compared to my flight two days before from London where I quickly fell asleep to the on board entertainment after complimentary glasses of wine, blissfully ignorant that I am actually high up in the earth’s atmosphere, the forty minute Lukla flight on an 18 passenger Twin Otter aircraft is more exhilarating than any theme park ride. 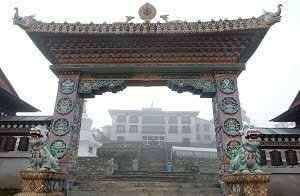 For most trekkers on their way to the Everest region, the only way in or out is to head up to Namche Bazaar. This takes two days along well kept trails. There are no roads here, no vehicles or motorbikes. 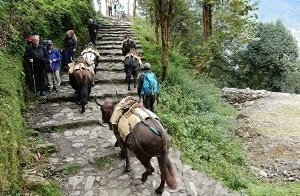 The only methods of ground transportation are by horse, yak or on foot. 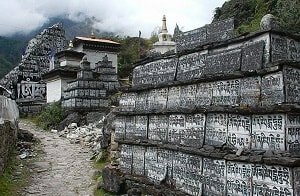 Trekkers come for the grandeur of the white capped mountains, however the valley trek over suspension bridges above pristine glacial melt rivers, through forests and passing by terraced fields and Buddhist monuments is well kept and outstandingly beautiful. 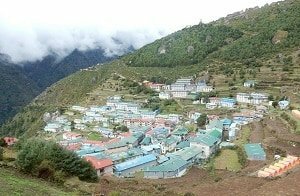 Initially humid, the air becomes fresh as the trail ascends to Namche Bazaar. This is a hub town, where you can get a haircut, go to a pub or buy any last minute trekking equipment and clothing. For those concerned about being completely away from all comfort for the next three weeks there are a surprising number of bakeries serving pastries, pizzas and great coffee. It has a very atmospheric feeling, perched high on the hillside overlooking the valley trekkers have spent the last two days traversing. It’s the perfect spot to spending a day acclimatising, with museums and monuments dedicated to the Sherpas and climbers of the region. The terrain changes with a crisper air. The landscape is more rugged and forests turn to rhododendron occasionally blanketed in cloud. 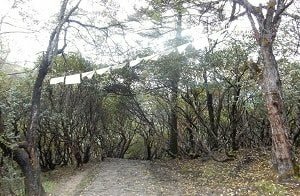 The trail passes by monasteries, stupas and prayer flags. The white mountaintops start to become a familiar sight. It’s important to get plenty of rest while acclimatising and the tea houses provide welcome respite from the trail. The teahouses are all unique but share similar traits. A cosy dining/common room, with a heated stove. Plenty of pots of tea and huge plates of food, with a large variety of choice. Friendly and smiling Nepali locals, guides and porters. They are always accommodating and have a great sense of humour. The guides share with me their stories and adventures, living legends who have made it possible for climbers to achieve their dreams. The three passes are very distinct, and the first to tackle on the circuit is Kongma La Pass. Setting off at 4am, as I ascended the ground becomes coated in a thin layer of snow and frost. There is cloud in the air but it’s possible to see the stars and the outline of the surrounding mountains. Further to the east is Island Peak, a 6189m summit accessible to novice climbers with guides. The way to the path heads north and drops in to the Khumbu valley to the west. The passes are not without challenge but the unspoilt beauty and quiet wilderness is deeply rewarding. 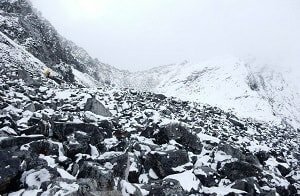 Following cairns up boulder slopes and past glacial lakes, then a final rock wall to the prayer flags that mark the pass. It’s a steep decent on the other side that leads to the kilometre wide Khumbu Glacier. 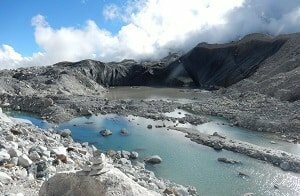 It feels almost like a moonscape, mountains of scree and rubble that is constantly changing and deep pools of glacial melt, the way across is a maze. Crossing to the other side brings the trail to Lobuche, a small village with teahouses by the edge of the glacier. From Lobuche it is not far to the last settlement before Everest, Gorak Shep. The journey to this point requires constant monitoring of my body as I was still acclimatising, taking plenty of rest and fluids. The next morning, feeling surprisingly great and well fed from a large breakfast and plenty of tea I continued on to the final few hours to Everest Base Camp. The climbing season is in the spring, so there are no campers in October. This gave a great opportunity to explore to the north across the glacier and really soak in the mountains of Pumori, Nuptse and Lhotse. To the east is the famed Khumbu Icefall, known to climbers as a treacherous changing maze of dark crevasses and shifting ice blocks larger than houses, stretching up beyond the horizon. To the north over the mountain wall is Tibet. To the south the immense glacier stretches out, carving the landscape. Considering Everest is the tallest mountain on the planet it is quite elusive. For one of the best views many trekkers climb Kala Patthar, rising above the Gorak Shep Settlement. At over 5600 metres, this is an achievement in itself, and one often climbed to meet the sunrise or sunset. I set off in the dark, with a clear view of the Milky Way and passing meteors in the night sky. No longer encumbered by a weighty bag (I had been travelling solo and self-sufficient) I ascended quickly and enjoyed the summit peacefully. 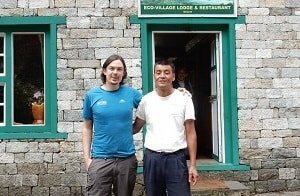 I was joined soon after by a Sherpa guide who shared stories with me of his work earlier in the year with an Indian Everest Expedition. 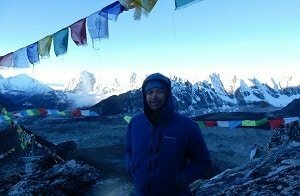 Everest mountain guide – one of the most incredible jobs! The clarity of the stars in the night sky is replaced with a glow rising behind the mountains, shining light on to the top of Everest. As the sun rose the growing crowd of onlookers shared a look of elation, this is a place unique on our planet, the scale and grandeur of the stone monoliths rising into the brilliant clear blue sky. 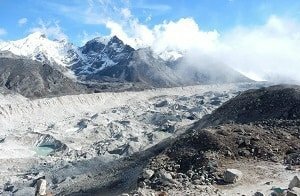 If you ever get the opportunity to visit the Everest region I would highly recommend taking in at least one of the passes. This allows you to turn the route you take into a circuit, and explore some of the quieter areas. Each pass provides its own beauty, interesting features and challenge, and each awards stunning views of the surrounding Himalayas.  Cho La (La means Pass in Nepali) is the second I attempt. Nearing the top, there is a scramble up a staircase of boulders, below a towering rock wall and the ascent makes for deep breathing due to the altitude. The top crosses a pristine snow covered glacier and a final short climb on rock to the prayer flags. Pausing to take in the phenomenal views, I continued, descending deep into the next valley where there is a second glacier to cross, the Ngozumpa Glacier (reputed to be the largest glacier in the whole Himalaya), again a wide maze of moving scree hills, glacial pools and cairns to follow. Over the far glacial wall is the lake side town of Gokyo. There are five lakes along this stretch crystal clear and millpond calm. 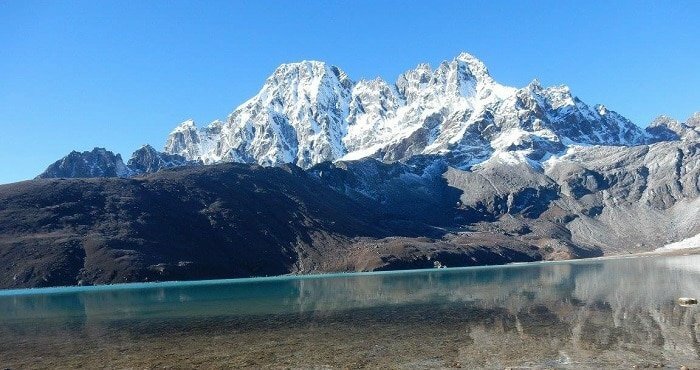 There are options to rest and explore here, to climb Gokyo Ri or to visit the lakes in the valley to the north. The final pass I took on, Renjo La does not go easily, even though by this stage I am well acclimatised and into the flow of trekking. But the views are worth it, and I am able to look back to see Everest one final time before descending the other side. There is a glacial lake nestled in the ridge walls of the mountains on the other side. The sky is clear and no wind in the air so I summoned the courage and took a swim in the lake. The swim is breath taking in its own way but I can bask in the sun to dry off and I feel refreshed for a long time after (much needed after ten days trekking!). The valley I descend I decide is one of my favourite spots on this trek, a very wild remote feel with riverside sandy beaches, stone farm buildings left alone and the view ahead dropping thousands of metres as the route descends. 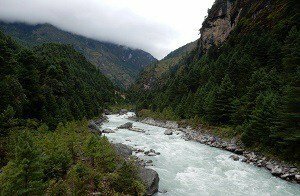 The next day the scenery changing to steep forested valley walls, deep canyons with fast flowing rapids and well-kept villages with Buddhist monuments. I arrived back to Namche Bazaar as helicopters fly in and out, dropping off supplies and passengers. A beer to celebrate then a final day back to the airport of Lukla, stopping along the way to reunite with the friends I had made on the way up. 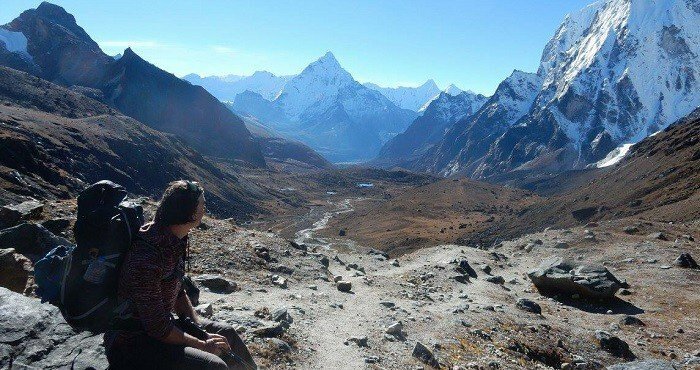 I know I am lucky to have trekked in many different places, but the Everest region and the three passes trek is my favourite. To me, it is awe-inspiring with countless breath taking views, and is ever changing in the variety and challenge that it provides. Want to join us? 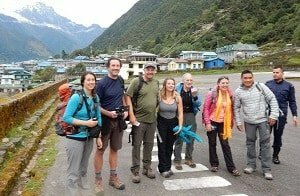 Our next departures for our Everest Base Camp Treks are departing in 2017: 25th March, 8th April, 22nd April, 7th October, 28th October and 11th November.